Put the bunny back in the box. What would you do if your wife was assaulted and raped? If you’re Nicholas Cage, you’d buy two candy bars. In Seeking Justice, Nicholas Cage plays Will Gerard, a regular guy driven, like so many of Cage’s characters, to the edge by extraordinary circumstances—driven to do things he never would have thought himself capable of, driven to employ skills he never would have guessed he possesed. In short, to transcend the commonplace. To be transformed by an oftentimes cruel world, and in turn to transform it, to bend fortune to his own will. Did I just compare Nicholas Cage to Nietzsche’s Ubermensch? Yes, I did. As the high school teacher sits in a New Orleans hospital lounge, waiting for his battered wife to regain consciousness, a curiously Bostonian, Wahlberg-esque fellow approaches him. Sympathizes. Introduces himself as Simon. Offers to “take care” of his wife’s attacker. What must Gerard do to signal his approval? Saunter over to the lounge’s vending machine and buy two ‘Forever Bars.’ What would Gerard owe this Simon, were the deed done? Eh, a ‘favor.’ What does Will do? What any dazed, emotionally traumatized, and enraged husband would do. He ‘goes ahead,’ as Bill Lumbergh would say, and drops some change for a little snack. And so the deed is indeed done. But that’s not all, folks! Simon’s group, like any vigilante conspiracy, is given to excesses, and Will Gerard, the english prof and avid chess player from New Orleans has bit off more than he can chew. And I’m not talking about those Forever Bars. “The hungry rabbit jumps,” goes the shadowy group’s catchphrase (for every secret society needs a cool thing to say; it’s like a handshake!). Meet another member of the Brotherhood? “The hungry rabbit jumps.” Eliminated a target? “The hungry rabbit jumps.” Mutate into a long-eared rodent a la Donnie Darko, become ravenous and leap up onto the kitchen table to reach some truffles? You guessed it: “The hungry rabbit jumps.” The whole time I’m sitting there going, “Put the bunneh in the box. 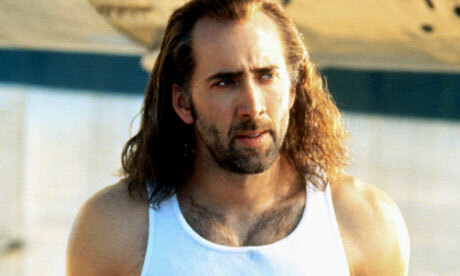 Why didn’t you just put the bunneh in the box?” What is it with Nicholas Cage and these furry little creatures? New Orleans works wonders for any film with a dark, criminal theme, and Seeking Justice is no exception. It’s no wonder why Nicholas Cage, that pioneer of the bizarre, seems to favor this setting (see “Bad Lieutenant: Port of Call New Orleans”). The post-Katrina city is a place of sharp juxtaposition, of wanton, costumed Creole excess crowded up against shopping-cart-pushing destitution, of posh hotels with Versailles-style french architecture a few blocks away from shantytowns. I like to think of it as a place where our dreams collide with our nightmares, where things both sacred and profane can occur. Like so many places recovering from devastation, New Orleans has an aura of unreality about it, of being outside of time, of being beyond any common measure of health or normality. And what could be more surreal than wandering through this mad place, pursued by criminals and cops alike for a crime you didn’t commit? Ask Will Gerard, he knows. The suspension bridge-tense plot takes Gerard from the jazz-echoing streets of the French Quarter to the obscure bayous of rural Louisiana, from the Superdome to a still-vacant mall replete with creepy mannequins, their plastic stares paranoid and accusatory in the lonely darkness, on a desperate quest for truth and redemption. Will the unfortunate English wonk find what he’s looking for, let alone a fairytale ending with his stunning and (and stunningly accurate with a pistol) wife? If you like vigilantes, candy, unintentionally humorous deaths, gun rights, or Nicholas Cage’s oddly sincere and utterly unique acting style (which he calls “Noveau Shamanic;” I do not jest—google it), then take the journey to find out. I give Seeking Justice four out of five melodicas, because I’m a hungry rabbit for more Cage. Put me back in the Cage. I could go on, but you get the idea.